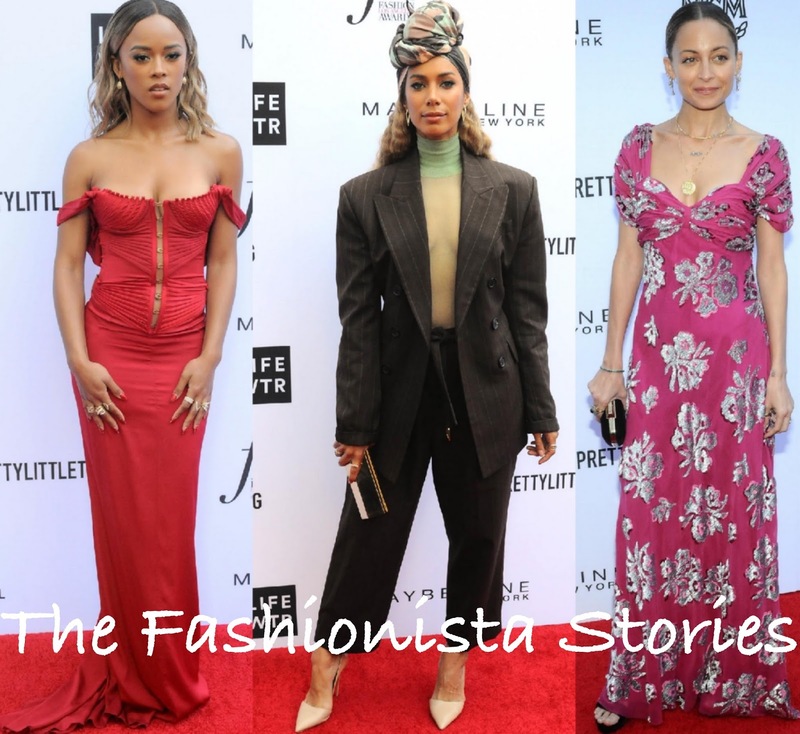 Last night(April 9th) the 2018 Daily Front Row Fashion Los Angeles Awards took place at The Beverly Hills Hotel in Beverly Hills, CA. Brigette Lundy-Paine wore a COACH PRE-FALL 2018 printed ruffle & lace panel, embroidered v-neck dress which was accessorized with a small blue top handle bag and metallic boots from the same collection. The printed dress makes a statement but the accessories adds to the appeal of her look. Kiersey Clemons also wore a COACH PRE-FALL 2018 dress. Her short sleeve printed lace panel dress was teamed with a black small bag & ankle strap pumps. I love her shaved head which topped off her look along with pink lips. Rowan Blanchard wore a COACH PRE-FALL 2018 dress as well which she teamed with a black bag and neutral color sandals. I would probably swap out the bag for a brown or neutral shade but she still looked great. Marsai Martin wore a white long sleeve ALEXANDER MCQUEEN shirt with a fishtail hem. The styling is what sells the look. The pink leather belt, CHRISTIAN LOUBOUTIN colorful stripe sandals and yellow tassel earrings brings life to this basic shirt dress. Jhene Aiko wore a CELINE SPRING 2018 sleeveless crepe jersey dress with large armholes and a cape detail back. I would have loved to see Jhene in sandals similar to Marsai's(see above) but instead she opted for a matching pair. Smokey eyes and straight off-the-shoulder tresses finished up her look. Joey King looked cute in a on trend look which featured the ATOIR 'Once Upon A Time' white bubble sleeve crop top and I AM GIA black & white stripe trousers. A JIMMY CHOO bag and a curly half-up half-down hairstyle finished up her look. Serayah dipped into the archives wearing a TOM FORD FOR GUCCI FALL 2003 red corset gown with a short train detail. On the runway, the gown was shown with the straps up but Serayah opted to wear them down. Serayah is pretty but I am not feeling the bodice. Leona Lewis turned to MARC JACOBS wearing a SPRING 2018 brown pinstripe suit with a sheer mint turtleneck underneath and a printed turban. I actually like this look but the only putting me off is the fit the jacket. Padded shoulders doesn't work on her. Nicole Richie wore a JUICY COUTURE FALL 2018 pink & glittery silver floor sweeping dress which was accessorized with a black clutch & sandals. Nicole's stylist Jamie Mizrahi is the designer at Juicy so it is no surprise that she is wearing the brand. Jamie also received the 'Design Debut' award at the event which Nicole presented to her. Mena Suvari wore a the AMUR 'Elle' black floral lace gown with pleated chiffon ruffles. Love the earrings but she should have gone with something less focus pulling because the gown stands out. Paris Jackson wore a olive & black MOSCHINO PRE-FALL 2018 bomber jacket and the matching slip dress which she teamed with floral boots and colorful beaded jewelry. For Paris, this works. Emily Ratajkowski wore a long sleeve yellow JACQUEMUS FALL 2018 floor sweeping dress with a gathered, knot detail bodice & v-neckline. The dress appears shorter on the runway but I like it either way on Emily. Plus the emerald stone earrings puts the icing on the cake.